Swimming has always been a part of Jamie Platt’s life. The Cherry Hill native had competed for Woodcrest and Barclay Farm swim clubs, Burlington and Camden County YMCA, Cherry Hill High School East and Susquehanna University for more than a decade. In that time, she was part of a record-setting relay team at the Cherry Bowl in 2001 and a sectional championship team with Cherry Hill East in 2009. So when Platt’s college swimming career ended after her sophomore year due to an injury, Platt wanted to find a way to stay involved in the sport. Just five years later, Platt is back in South Jersey and is ready to coach one of the strongest swim clubs in the Tri County Swimming Pool Association. Sunnybrook Swim Club in Moorestown recently hired Platt to take over as head coach of its competitive swim team. Platt will officially take over when preparation for next summer’s season begins in May. Platt can’t remember a time she didn’t spend either in or around a pool. She began swimming at the age of 4 and soon after was competing for the Woodcrest Swim Club in Cherry Hill and for the Camden County YMCA. For more than a decade, Platt’s name was in the Cherry Bowl record book. She was part of the girls’ 9–10 medley relay team for Woodcrest in 2001. The team set a Cherry Bowl record with a time of 1:13.05 and was later named to the Cherry Bowl’s 50th anniversary team. Platt continued to swim in high school, competing in freestyle and individual medley races for the Cougars. She would attend Susquehanna, where she switched roles from swimming to coaching in her junior year. Platt quickly developed a passion for coaching. One of her favorite parts of working at Susquehanna was recruiting and keeping track of high school swimmers. Platt loved coaching so much, she decided to take a job at home. In 2012, she began coaching at Woodstream Swim Club in Marlton, a position she held for two seasons. Shortly after graduating from Susquehanna in 2013, Platt got a job as an assistant coach for Juniata College’s women’s swimming team in Huntington, Pa.
After just one season at Juniata, however, Platt wanted to return to South Jersey. Platt returned to Cherry Hill, landing a teaching job at Rosa International Middle School. She enjoys her position at Rosa and said teaching made her want to continue coaching at the youth level. “It was then that I realized I loved this age group,” Platt said. Shortly after returning to South Jersey, Platt took the head coaching job at Downs Farm Swim Club in Cherry Hill. Then, in 2015, Platt took a second job when she was hired as the head coach for the YMCA of Burlington and Camden Counties Phoenix Junior I Group. 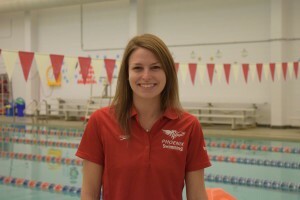 She was hired after connecting with Chris Brookover, the YMCA’s competitive swim director and a fellow Cherry Hill resident. Similar to her experience at Susquehanna, Platt said she has learned a lot from Brookover about building a program. When the head coaching job at Sunnybrook opened, Platt was unsure if she should apply. However, she credits Brookover with giving her the extra motivation to go for the job. Platt’s new job is a big step up from her position at Downs Farm. In the Tri-County Swim League, swim clubs are divided based on skill level to allow clubs to compete with similarly skilled opponents. Downs Farm competed in the D Division of the Tri-County Swim League last year. Sunnybrook, meanwhile, will be in the A Division this year, the highest division. Despite the high expectations, Platt said she’s excited to coach at Sunnybrook. She plans to take what she has learned at her previous jobs to further strengthen Sunnybrook. “Being able to have a team that’s large, that wants to be competitive and wants to be like a family is the thing I’m most excited about this summer,” she said.